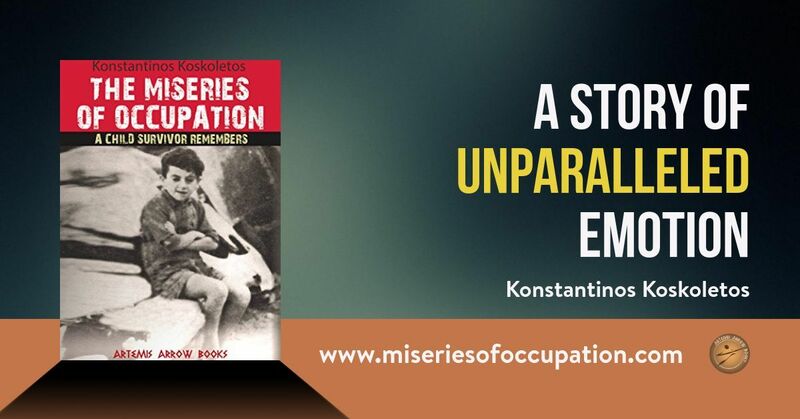 Konstantinos Koskoletos’ Miseries of Occupation: A Child Survivor Remembers is a fascinating historical account of a grim time during and after World War II in Greece. It is a tale of heroic resistance, cowardly behaviors, and a son’s 70-year quest to vindicate his father’s courage and sacrifice. It’s a book that rings true, and even the subsequent lawsuits he endured in Greece to suppress his truths reflect how this period of time still haunts and troubles families that were torn apart by the Civil War that followed the terrors of the Nazi’s occupation. As an aside, my grandparents brought over family that had been trapped by World War II and the Civil War. They knew they had fought for one or the other of the factions, but never asked. Many years later, other family members emigrated. At a party, my mother innocently asked their ideological affiliation during and after the war. Crickets. The silence was deafening and my mother never asked again. The wounds, even 30 years later, were too deep and the only way both sides of the family would ever get along was to keep silent. Mr. Koskoletos experienced this same wall of silence when he published his book in Greece and was forced to endure nine years of lawsuits to keep his truth from being revealed. Luckily the Greek Judicial System overturned all the complaints and allowed the book to take its place among the volumes that depict this dark time in Greek and world history. As if it wasn’t bad enough that the Nazis were instrumental for causing brutal atrocities, now political ideologies, greed, and unenlightened self-interest caused families to self-destruct in the aftermath of the war. Only brave men, like Koskoletos’ father “Leonidas”, stood up for their beliefs and paid the ultimate price. Betrayed by Greek Nazi collaborators, Leonidas was imprisoned for years and despite no evidence that he was ever an actual member of the communist ELAS, was murdered along with other men on Aegina. Koskoletos was only 11 when this happened, and yet it became his quest to exonerate and vindicate his father’s ultimate sacrifice for his beliefs. What follows is a harrowing account of survival in a post-war world where Iasona (Mr. Koskoletos’ alter- ego) not only sets out on his quest to discover the fate of his father, but to become educated and grow to manhood as well. Despite horrific conditions and odds, he managed to graduate from the Archimedes Engineering Academy and emigrated to America, where he founded an engineering firm, married, and had three children. However, his father’s fate was always with him, and he embarked on his quest, as did Jason (Iasona) did seeking answers to the questions that troubled his childhood. Mr Koskoletos’ book is haunting, compelling and impossible to stop thinking about even when you’re finished. He has interestingly changed the names of his characters to reflect their attributes as well as raise the tale to mythic levels. His names reflect the attributes of his characters – Iasona (Jason) for his questing nature, Ippoliti (Hippolyta) for her Amazon warrior protection, Penelope for her devotion to her husband, and Leonidas, the legendary King of Sparta who stood as a bulwark to protect Greece even as he sacrificed his own life. Uncle Iavaris was named for Javert in Les Miserables for his blind self-interest and inability to see the truth. Even so many years later, the horrors of that time are relevant. It’s a cautionary tale of war, betrayal, and family disintegration. It’s harrowing, extremely dramatic, and very sad. The book is extremely popular in its original Greek, and has received nothing but praise. Now it’s being presented in an English translation to an entirely new audience. Miseries of Occupation is a testament to courage, unshakable belief, and tenacity. From an early age, the protagonist struggles and prevails against insurmountable odds, so that many years later, he is able to visit the site where his father was killed and hold a memorial service. It’s an interesting video accompaniment to the book, in Greek and English, but the emotional impact is still felt despite any language limitations. I highly recommend this book to academic libraries and teachers of World War II subject matter and its aftermath, obviously Grecophiles, and historians. I also recommend this to anyone interested in seeing the outcomes of civil war, betrayal, and mistrust. It’s an excellent autobiography, with mythic overtones and a disturbing and complicated tale of triumph.